Wisconsin Music Man: Keith Urban, Country? 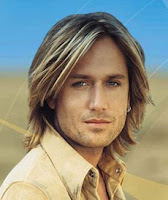 This summer Keith Urban will be performing at The Bradley Center on July 26th. Is this truly country music? They dress him up to compete with all the pretty boys of country, so that's strike one. Every cd save for one, has a song with the word "love" in it. That's strike two. He's from Australia, strike three. If you are into lots of songs about love, and you like to have a pretty boy do the singing, then by all means go to this show.....I guess.